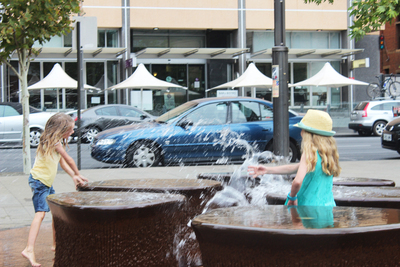 Adelaide has quite a few fountains, but they're not all as fun as the one outside the South Australian Museum. It's actually called 14 Pieces and is a piece of public art inspired by the fossilised backbone of the Ichthyosaur (found inside the museum). 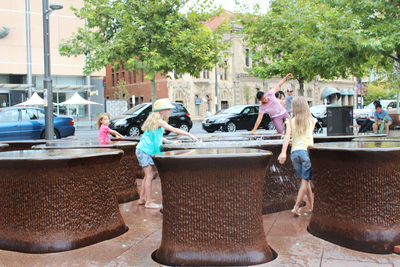 As the name suggests there are '14 pieces' to the fountain, and there is enough room between each for children to run between them with ease. There are no discouraging 'KEEP OUT' signs, in fact children are even encouraged to play. During the Summer Holidays the museum had a 'Summer Splash' program where the fountain became a set of rock pools, each containing different things for children to play with. One a hot day the fountains are a welcome sight, and a splash around is a great way to cool kids off if they're not enjoying shopping in the heat. 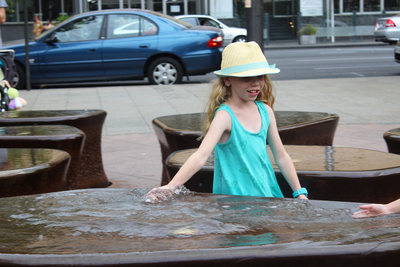 Even though there are no actual 'fountains' kids can still get pretty wet, especially if they start splashing. Just make sure they watch out for passers by, because it's a pretty busy area. Take a break from shopping, or pop by after a visit to the museum or art gallery. 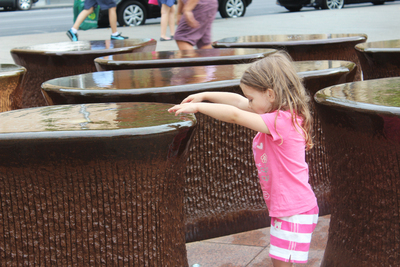 Have you ever had a play in the fountain? 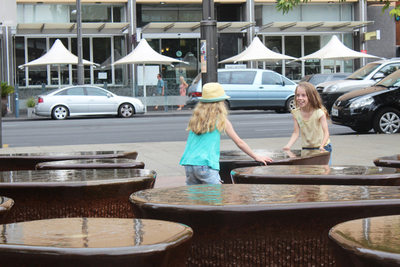 Do your kids have a favourite piece of public art in Adelaide?